Highly anticipated: Solid state drives are becoming almost as affordable as mechanical drives in terms of cost/capacity ratio. Micron is now advertising its QLC solutions as a way to replace dated mechanical drives without spending significantly more for SSDs. When shopping for a solid state drive there are many factors to consider. Aside from price and performance, security and failure rates are also significant factors. The type of NAND flash and its arrangement within a drive plays a major role in determining some of these criteria. Earlier this year, there have been several market indicators pointing towards cheaper SSDs. Notably, Samsung, Micron, and Toshiba have all debuted QLC-based solid state drives that have higher capacities without drastically increased costs. Going forward, Micron has now been able to match enterprise-grade mechanical drives on a cost per gigabyte basis. 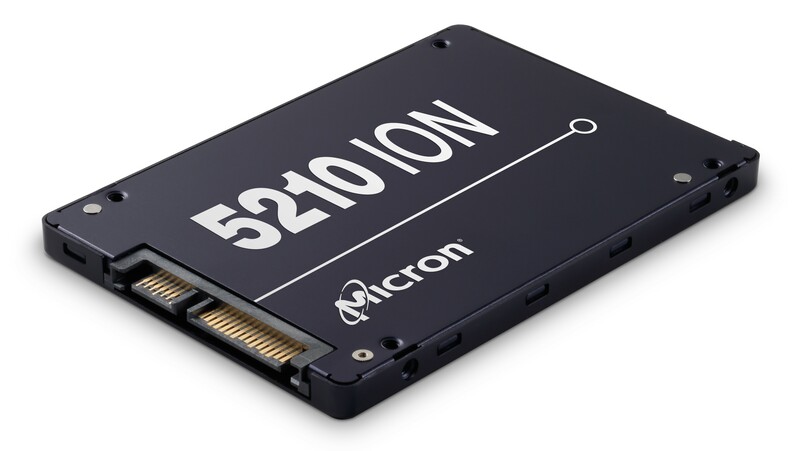 Compared to a 2.4TB 10K hard drive, Micron's 5210 ION SSD costs the same per gigabyte and is offered in capacities of 1.92TB, 3.84TB and 7.68TB. Although still more expensive if maximum capacity is the goal, the performance benefits and total cost of ownership savings from having solid state storage are easily understood. In real world testing by machine learning solutions provider Colfax International, a 2.3TB set of images was run through a TensorFlow workload. The set of 100,000 images took just over 15 hours on machines with mechanical drives, but that time was reduced to under 2 hours by switching over to solid state storage. Even larger data sets are said to see even greater time savings. Delivering read speeds of up to 540MB/s and 90,000 random read IOPS, the 5210 ION is not the fastest drive on the market. However, it is still 175x faster in random reads, 30 times faster in random writes, and offers double the sequential throughput of mechanical hard drives. As pricing continues to fall on solid state storage, QLC NAND could be the technology that reaches a point where it is in fact cheaper for consumers than mechanical drives. Even if not, a few terabytes of solid state storage available as a single drive for reasonable pricing is still something to be welcomed.